Recording on a snowy Valentine’s Day. Cuddle up with your significant other and enjoy the show. We also kick off our third year of providing you the information you need to make your geocaching experience the best. New segment – Around the Water Cooler – Do cache runs spoil the enjoyment of geocaching? Let us know and we can discuss on the next show. If you enjoy this podcast, use the ‘Share and Enjoy’ options at the end of each listing. Or provide feedback on iTunes. Art has a flashback to the 1980’s as he talks about the super party animal Spuds MacKenzie. New website is live – if you are using an rss reader to download this podcast, please resubscribe. My writing focus has been toward My gig at Examiner.com This post does not fit within the guidelines, of an Examiner article, so I finally get to update the blog. Having good weather on January day is a rare occurrence in Colorado. Karen and I had discussed making a cache run into northeastern Colorado for the purpose of completing map squared for the state Delorme challenge. I was able to quickly run a pocket query for the route heading up I-76. We even had a few caches in nearby Nebraska. A contingency if time allowed us to ‘color’ in another state on the US map. I loaded Karen’s GPS first. A Garmin GPSmap 60cx with the query results via Geocaching Swiss Army Knife, and also updated her GPS with the weekly local caches in out area. I repeated the exact procedure with my new Garmin Oregon 300. I was looking forward to work the GPS through its paces. A few minutes later, we were off. As we entered the area of where are first caches should be, Karen said, “There is one at the next exit” , my GPS showed nothing. Karen guided me to the first cache, but still did not show up on my GPS. Since we were relying on the Oregon for the cache descriptions, we thought we were dead in the water for this trip. However, having a smartphone saved the day. I was able to use the browser to access geocaching.com and get the first cache description. Success followed soon after. We were able to complete the map segments in a few hours. We also had time to make a quick run into Big Springs, NE. 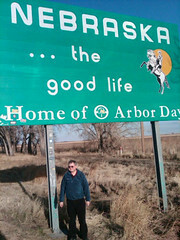 Where we found our first Nebraska cache at a truck stop just off I-80. After that, we began out return back to Denver. We only found a total of 12 caches on 12 attempts. It wasn’t the quantity, but the adventure into a part of Colorado we had never visited. I would like to return to the cities of Fort Morgan, Sterling, and Julesburg to explore their Colorado History. We met two very nice gentlemen that were operating the welcome center in Julesburg. We introduced them to geocaching, and told us about the 10K volkswalk that starts and ends at the center. Redundancy is a good thing: Having a second GPS loaded with our caches to hunt saved this trip and make it for a fun day for us. Learn how your GPS works BEFORE you go: I figured out since I was loading two different files of GPS points, I need to give them two different names. I had overwritten the NE Colorado caches with the local caches. Have fun: Our goal was not to kill ourselves logging a large quantity of caches, leave some to return and explore the area in depth at a later date. CSG Nano Show #4 – Did Groundspeak violate its cache placement guidelines?